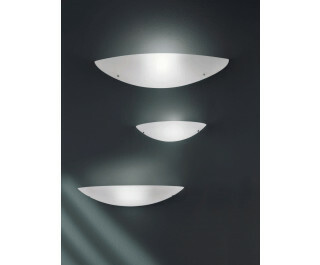 The Boccia AP Wall Sconce by Vistosi has been designed by Studio Tecnico Vetreria Vistosi 1993. The Boccia AP wall sconce is part of a light collection which gives the environment in which it is located simplicity and functionality. The fixture is available in white glass color and in a choice of both fluorescent and halogen lamping. A collection of lamps in satin-finish blown glass.